There are too many cars using Flinders Lane. The City of Melbourne’s pedestrian and transport plans both recommend the section between Swanston and Elizabeth should be for people, not cars. Yet most cars using Flinders Lane simply don’t need to be there. They could use Flinders Street or Collins Street instead. The City of Melbourne has put a lot of effort into getting commuters into Melbourne’s CBD by bike but there is no way to move around once we are there. Cars and vans can use Collins and Flinders but for bikes there is no safe route on the south side of the CBD. People using bicycles to access Melbourne City Library, the CAE, restaurants and office blocks all have to brave Flinders Street or Collins Street to get where they are going. Both these streets see many crashes, and many more Melbournians are discouraged from riding altogether by the danger of these roads. Metro Tunnel closed Flinders lane to through traffic in February of 2018, only allowing local deliveries and vehicles that need to access car parks. Five Melbourne BUG volunteers counted traffic during this time and we found that very few vehicles need to use Flinders Lane. *Other is traffic entering the Wilson car park and the Westin Hotel that can exit straight onto Flinders Street and Collins Street without needing to cross Swanston St nor re-enter Flinders Lane. If the number of vehicles on Flinders Lane were reduced then cyclists could travel both ways. If cyclists could travel both east and west on Flinders lane it would be a low speed local route to get people the last mile to their destination in the CBD. Exhibition street cyclists to access Spring. Calming Flinders lane won’t just benefit cyclists. By reducing the number and speed of vehicles these changes will make the street safer and more enjoyable for pedestrians too. As less traffic uses the street there will be further opportunities to remove parking to widen the pedestrian area – desperately needed on Flinders lane’s narrow footpaths. For pedestrians and bicycle safety and comfort we need to limit the number of vehicles on Flinders Lane. To do this we must block through traffic so that each vehicle can only use Flinders lane for one block before turning back into Flinders Street or Collins Street. Traffic could be limited with turn bans, raised concrete medians in the middle of streets like Russell or by reversing the direction of travel in some sections. We’ve presented a few options for how this could happen, but there are many more that would work just as well. Each block needs to be looked at holistically after discussion with all the relevant stakeholders. Some changes we’ve suggested could even provide the opportunity to increase open space on Elizabeth street by making some traffic lanes redundant. Whichever traffic calming methods are chosen, the goal is to prevent rat runs and return the street to the people. Why do cyclists need to travel both ways? Collins Street has a high crash rate. Flinders Street was Melbourne BUG’s preferred south CBD route, but recent tree plantings and tram stops have made this more difficult. The little streets are the only option left. Birrarung Marr is often blocked by festivals and doesn’t provide any local access within the CBD. 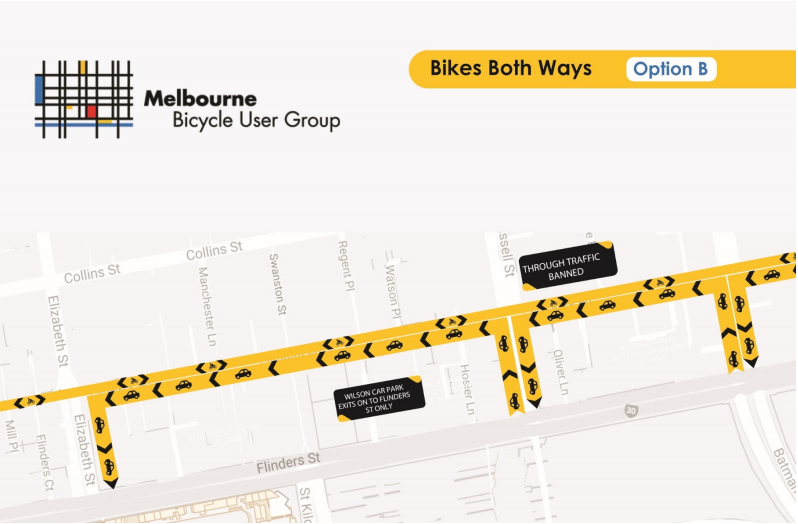 Letting bikes go both ways would provide crucial local access for CBD residents and well as the many students and City of Melbourne library users who need to access Flinders Lane. Many cyclists are already going up Flinders lane to Swanston Street because it is the only option. Our plan would formalise what already exists. Does this have to be expensive? Melbourne BUG does not recommend any expensive civil works. Letting bikes travel both ways could be as easy as installing traffic lights for cyclists going in the other direction, coupled with lane markings. There are ways our treatment could be improved with some civil works. These would be at some cost though – and we think that the first priority should be to get the changes in. Isn’t Flinders Lane too narrow to let bikes travel both ways ways? No. Bikes travel both ways commonly on narrow streets in the UK, France, Germany and Belgium. Belgium’s guidelines require a road width of 3m – much narrower than Flinders Lane. Even the most conservative cycling countries accept contra-flow lanes on roads Flinders’ lane width. One study shows that these lanes actually reduce crash risk by forcing vehicles to travel slower. Another study comparing very narrow contra-flow lanes to wider streets found no difference in crash risk. All vehicles are going slow and are able to make good eye contact so they can pass each other safely. When the occasional large vehicles approaches cyclists usually get off their bike to allow the truck to pass. This would not be necessary though for the large number of delivery vans who could safely pass bicycles on Flinders Lane. Will this be dangerous for pedestrians? This route will work for cyclists as a local route. Most cyclists will only use it for a block or two to get onto a bigger road. Importantly, cyclists travelling the ‘wrong way’ will be going uphill and therefore will be travelling slower. Fast moving cyclists will get frustrated by the slow traffic light sequences on Flinders Lane and Little Collins Street and will likely continue to use Flinders Street and Collins Street. Has this been done before in Australia? Contra-flow Lanes have already been implemented in South Australia on very narrow roads. Adelaide Council has been letting bikes travel both ways on streets Flinders Lane’s widths for years. A terrific paper by an Adelaide researcher on this topic is attached. There are local examples of narrow contra-flow lanes all throughout Melbourne with Yarra and Moreland leading the way. One great example being Truscott Street in Brunswick. These lanes have worked for years without any community backlash or safety problems. Parking on one side of Flinders Lane could be retained under our plan. Removing some 1-hour parking and converting it to loading zones or 5 minute parking would help to give more space to pedestrians and reduce traffic particularly in the evenings, but it’s not absolutely necessary. The area between Spring and Exhibition has 6 parks on the north side of the street. These would need to be removed. Isn’t there too much traffic on Flinders Lane to make this work? City of Melbourne’s transport and Cycling plans both recommend that Flinders Lane between Elizabeth and Swanston should be a place for people, not cars. And yet far too many cars use it everyday. South Australian experience and international guidelines state that there must be less than 1,000 vehicles per day on a narrow road with a contra-flow bicycle lane. To achieve that number you can only allow local for cars accessing car parks or deliveries. Flinders lane is currently flooded with through traffic trying to use this street as a rat run. Google Maps will often suggest drivers take Flinders Lane to get from Albert Street to Spencer Street. If traffic calming is used to stop rat running very few cars need to use each block. How many vehicles need to use Flinders Lane? In February of 2018 Melbourne Metro closed Flinders lane to through traffic, allowing only pick ups, deliveries and people who needed to use local car parks. We did a traffic survey during the closure. Only cars accessing car parking on or off the street could enter. Loading and resident parking were allowed but not rat running. can exit via Flinders or Collins Streets. To reduce traffic sufficiently, the current exit from the Wilson car park onto Flinders Lane must be closed, so that cars exit via the exit ramp this car park has on Flinders Street. 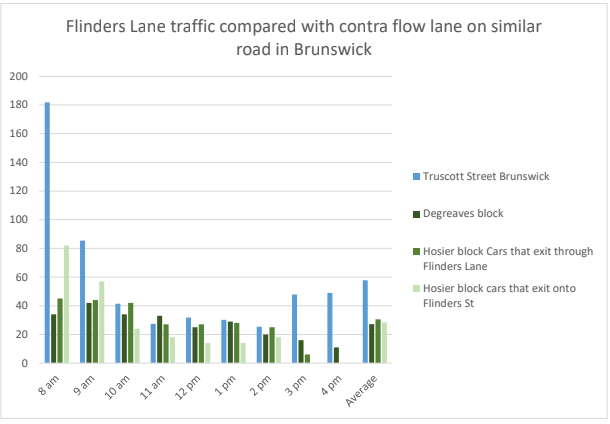 As a comparison, Truscott Street in Brunswick has a similar width to Flinders Lane and allows bikes to go both ways with an average of 1 vehicle every minute. If contraflow works on busier streets in Melbourne it can work on Flinders Lane. Figure 2. Truscott St Brunswick vs Flinders Lane. If cars have to turn into Swanston Street won’t that slow bike traffic on Swanston? Victoria Police are moving from Flinders Lane this year (2019). This means there will be no more parked police cars on Swanston Street and therefore a lot more space for bicycles and vehicles to share. 60% of the cars that would exit via Swanston Street are commercial. If loading was banned between 4:30 and 6:30pm (not a high demand time for deliveries in any case), then the number of vehicles during the afternoon cycling peak could be reduced to one in every three minutes or less. The footpath outside Young & Jacksons is very crowded. We propose widening the footpath by eliminating parking (mainly used by police), leaving space for a bike lane and no motor traffic. As well as easing pedestrian congestion, this will be a vast improvement for bikes compared to the current squeeze between trams and parked vehicles. Going in the other direction, loading zones could be provided with a peak hour clearway, an improvement on the current 24 hour police parking there. There are some cars that need to use each block of Flinders Lane – but not many. Our plan maintains full access for deliveries, with no reduction in car parking necessary on most blocks. Could we have a trial first? There’s no reason that the traffic calming measures could not be trialled first. Temporary barriers could be inserted where we recommend road blockages coupled with new signs. After a few months, if traffic has reduced as we predict then bicycles lights can be installed to let bicycles go both ways. We think this could work on all the little streets. International experience suggests that the more streets bikes can go one way on, the less confusion there is for motorists and pedestrians upon seeing a bike going the other way. Flinders Lane should be first because it is closer to the south side of the CBD, and it is already more popular with cyclists – particularly in the Degraves block. Our research has found more on street bikes parked on Flinders Lane than Little Collins. 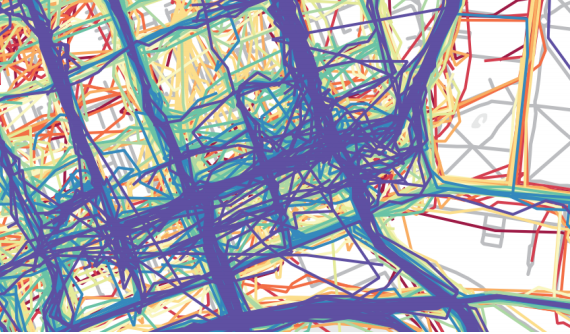 Riderlog data is not scientific but the most recently data publicly released as part of City of Melbourne’s transport plan shows that Flinders Lane is more popular than Little Collins for bikes. Importantly, Flinders Lane provides a ‘last chance’ for Elizabeth Street cyclists to get onto Swanston Street and Princes bridge to exit the city. Figure 3. Riderlog cycling data from City of Melbourne’s Transport plan. Is there an opportunity for more open space on Elizabeth Street? Yes. Depending on where you send traffic there are lots of different options that could free up open space on Elizabeth Street. We’ve presented three ideas below, but the options are endless. Figure 4. Elizabeth St Options. 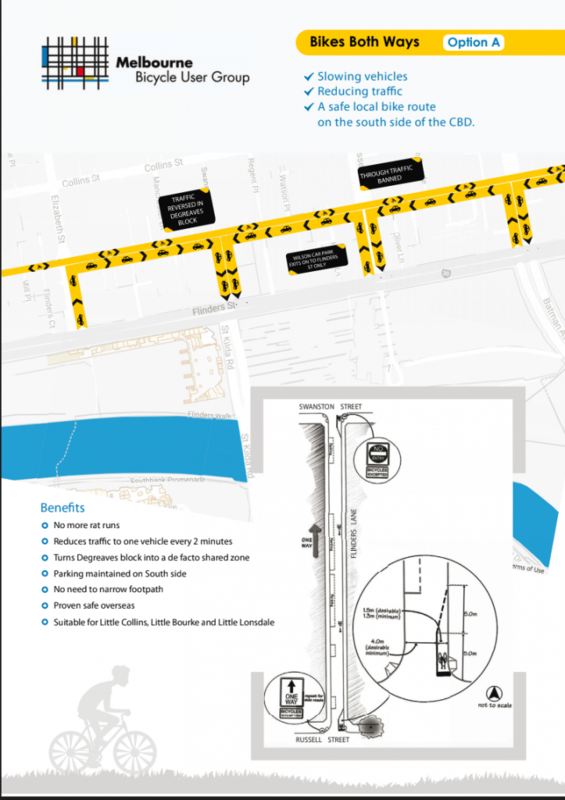 The glossy documents claim that “Fishermans Bend [will be] an exceptional place to cycle”. However the proposed network relies on eight new bridges which are unfunded. See Fishermens Bend Framework (PDF). These bridges will also have uphill grades to climb. On road cycle lanes are not physically separated from motor traffic which will deter most people from using a bicycle. For example Lorimer St is listed as an “existing on-road cycling path.” As an example of the level of service for bicycles it is poor and only a few percent of the population will choose to cycle at this level of provision. Segregation on Lorimer Street was proposed by Melbourne BUG but has been rejected. Nothing is proposed to prevent rat-running on the street grid. As usual with Government “strategies” the hype is never matched by action, we expect Fishermens Bend to be no exception. Today’s (8/10/2018) announcement from Richard Wynne, minister for planning, comes days after his government deleted the protected bike lane promised for the massive expansion of the Swan St/Hoddle St intersection, in his electorate. St Kilda Rd is divided along most of its length between City of Port Phillip (CoPP) and City of Melbourne (CoM). St. Kilda Road is the main commuter route for people who ride bikes from the south eastern suburbs into the city, with over 3000 cyclists per day. It is the second most dangerous street for cyclists in Melbourne, with 174 crashes between 2006 and 2015. There is a narrow bicycle lane, with ‘car dooring’ a major concern on this route. For about 10 years now a masterplan has been in preparation by CoM, CoPP has been working hard to get safe bike lanes and VicRoads has done the preparatory work to make it happen. The masterplan has never reached the stage of a draft for public comment, but has always included protected bike lanes. About eight years ago, this was leaked to the media who door-stopped the then roads minister (now treasurer of Victoria) Tim Pallas about the idea. His off-the-cuff reaction was to reject safe bikelanes in favour of “easing congestion” for cars. The masterplan then gathered dust for about four years before the Balieu Government was elected in 2010 and indicated they were willing to take a fresh look at St Kilda Rd. City of Port Phillip, City of Melbourne and Local liberal member Clem Newtown-Brown pushed hard for safe bicycle lanes on St Kilda Road. After forming government in 2014 Labor promised to investigate protected bicycle lanes. During construction of the Domain Station, motor traffic in St Kilda Road is constrained, creating a once in a lifetime opportunity to construct safe bike lanes while traffic levels are low. VicRoads spent six months and over $300,000 investigating options for protected bicycle lanes. The study outcomes haven’t been released but Vicroads has looked at protected lanes in the centre of St Kilda Rd, adjacent to the tram tracks. This time it was the Premier who was asked on talkback radio and replied “we won’t be having any of that”. Although the project hasn’t been officially cancelled, the Premier’s comment makes progress unlikely. City of Port Phillip stated http://www.portphillip.vic.gov.au/apr-2017-media_6957.htm that they would prefer footpath adjacent protected lanes. No details are known for the design of centre-of-road lanes. If done well with effective separation from cars, with controlled turns at all intersections to remove conflict with motor vehicles, centre-of-road lanes would be much better than the current door-zone lanes. We believe however that a superior option exists which should be considered. Please read on and give us your comments below. Melbourne BUG’s proposal is for bike lanes adjacent to the footpath, with a buffer between bikes and cars provided by the nature strip (grass and trees) as well as the car-parking lane. This is possible because the trees in St Kilda Rd are old and due to be replaced, so new trees can be located closer to the centre of the road. Putting a protected lane in the usual position, next to the kerb, is problematic owing to the large number of driveways, so while the current door-zone lane hides bikes from cars leaving driveways, a kerbside lane will hide bikes from cars leaving the road. Putting the lane next to the footpath, with effective delineation to deter pedestrian ingress, will create space for a car to wait out of the traffic lane before or after crossing the footpath and bikelane. Cars will cross the bike lane at right angles, with good visibility. The footpath and bikelane could be raised to present “piano keys” to cars, slowing them on the approach. Locating the bike lane adjacent to the footpath recognises that bike riders are vulnerable road users, more similar to pedestrians than to cars. Whilst the current users of St Kilda Rd might include many who are commuting into the City, we know that most people will only cycle short distances. They aren’t doing it at the moment because they don’t feel safe, but provided with safe lanes they will be more likely to. 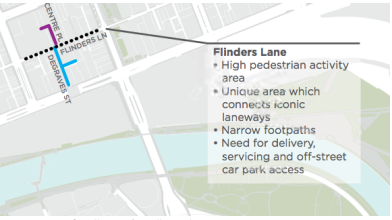 Using a bike to access addresses along St Kilda Rd will be encouraged by these lanes. Centre-of-road lanes are possible in a small number of roads in Melbourne. Changing driver behaviour will be more successful if road layouts are well understood and predictable. Making St Kilda Rd different to 99.9% of Melbourne’s roads is not ideal. The emergence of dockless bikeshare will also encourage short trips by bicycle. The huge success of these bikes is a game-changing opportunity to take cycling mainstream. Massive uptake of share bikes will make short trips by bike common and an attractive way to get to nearby destinations. We believe that focusing on what current cyclists want is only part of the story, and there are many people not currently using bikes who will find ubiquitous dockless sharebikes very convenient. We base this forecast on the experience of other cities as well as Melbourne’s experience so far. A centre-of-road lane works against short trips by making it harder to access mid-block destinations. Trams on St Kilda Rd will continue to dominate movement for longer trips but share bikes could take over for short trips. Also, surprisingly, trams can’t cope with the load against the peak direction, as anyone trying to get into the City in the evening peak would know. Imagine watching full trams bypass your stop, and seeing a share bike sitting on the nature strip next to the safe bike lane. Our position is that government should evaluate both options with costed designs for each and public debate about their relative merits. Planning is underway for major changes in Sydney Rd including disability access tram stops and possibly protected bike lanes, wider footpaths and better use of parking off Sydney Road. This is a once in a lifetime chance to make Sydney Road safe and welcoming for all road users. Moving parking off street will allow wider footpaths, protected bike lanes and trams no longer held up waiting for car parking movements. Come and help the campaign, next meeting Thursday 6pm, St Ambrose church meeting room 287 sydney Rd Brunswick. For more information see Revitalise Sydney Road. Whatever your opinion on a one-meter passing law, good data is hard to come by to know for sure either way. It might be the #157th most important thing to make riding a bike safer and more popular, or it might be the next best thing after protected bike lanes and filtered permeability. States that have introduced this law have done no before-and-after studies to determine whether there was any effect, beneficial or otherwise. Victoria may introduce a 1m law soon, so time is short to rectify this data deficit and get measurements before a law exists, and to continue with measurement after a law is introduced. You can help by volunteering to mount a PassBox on your bike for a week on our website for this project at http://passboxmelbourne.com/. City of Yarra is our next door neighbour. Two candidates there are making cycling issues prominent in their campaign. 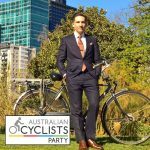 In Nicholls Ward (Nth Carlton, Fitzroy) Troy Parsons is standing, endorsed by the Australian Cyclists Party. In Melba Ward (Richmond), local trader Herschel Landes is standing as an independent. Read our Our detailed plan for South Bank Boulevard and then sign the petition! Protected lanes on Flemington Road. Green paint (in places) is all that will join two of Melbourne’s rare protected bike lanes, and only during peak hours. Failing to learn from the part time, part way, paint only, parked in bike “lanes” in Exhibition St, The City of Melbourne has announced similar poor quality provision between the protected lanes in Latrobe Street and Albert Street. 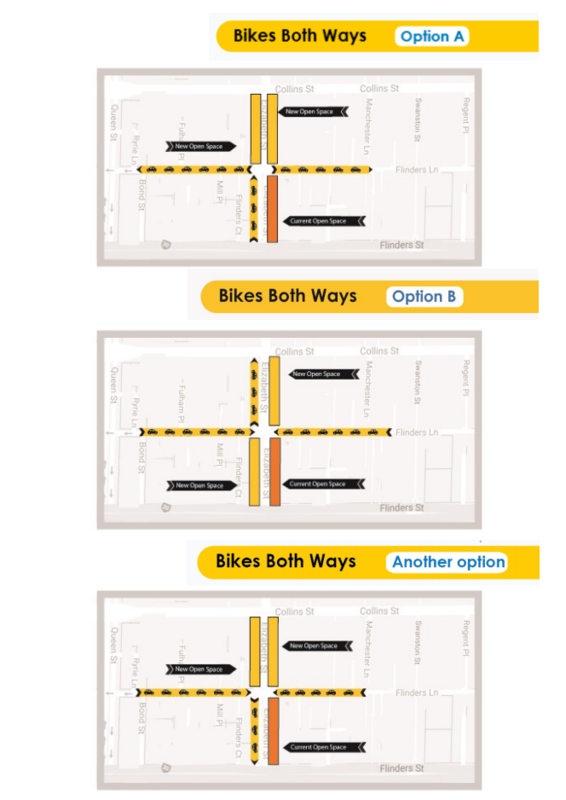 This is a lost opportunity to connect two (Melbourne only has three) protected bike lanes and link them with a facility of similar high standard. Eastbound, going up Latrobe St will require a right turn into Exhibition, then a block of Little Lonsdale St, which is not wide enough to accommodate a bicycle and a car – so you will need to hold up the traffic and ride up the middle of the street. Then make another right turn, into Spring St.
Coming into the city will be a peak hour only clearway bike lane – we know from Exhibition Street how well that works. Then a right turn into Spring St and another part time unprotected lane. If you are coming in from Fitzroy you will have to go out of your way to reach this excellent facility because Vicroads determined that Victoria Parade is not for bicycles (too narrow presumably), then come back up to La Trobe St, or else if you are turning left at Nicholson Street, risk the dangerously narrow car-door bike lane to get to Spring St. It’s a dangerous door-zone lane because the City of Melbourne is unwilling to remove four car parking spaces. This is not the way to make cycling an attractive option for the average person. It is a way to ensure cycling stays a small niche of the transport system.